A full obituary for Kenny will be posted shortly. A Graveside Service will be held at Highland Cemetery on Tuesday, February 19, 2019 at 1:00 p.m.
To leave a special message for the family, please click on "Share Memories". Add your memories to the guest book of Kenny Garrett. Around 1990 I planned what became an annual summer seminar on computers and synthesizers for music teachers to be taught at Casper College. I asked Kenny if he would teach the synth half of it. Teaching a college class seemed a little too buttoned down and high falutin’ to him. I promised him he would never even see an administrator, just the students. Of course, he agreed. He was always willing to share what he knew. Kenny gave a short one-man concert on the night of the first day of class, playing multiple instruments to show the teachers what synths could do. I was shocked to hear him fumble at the start of one of the pieces. “Fumble” is far too severe. A hesitation. A couple of notes that lacked his innate musical sensitivity. It turned out that one of the backgrounds he had pre-programmed had inexplicably transposed itself up a third. It took him a two seconds to discern the problem, find the key, and readjust his entire performance to accommodate it. If a classical player prepares the “Piano Concerto in E-Flat,” you can bet they won’t switch it to G major at the last second. By the way, the dean of faculty actually did drop by his classroom that first day. The Dean! Many lesser administrators are never seen in the wild even during the regular school year! Both Kenny and the dean survived the encounter unscarred. Sherry and Family our deepest sympathies go out to you. We will miss the fabulous music Kenny made. What can I possibly say about a man who influenced so many aspects about how I look at music. As a keyboardist, I am beyond grateful for the honor to have worked beside (and so greatly admire) his genius - for the many opportunities he opened up for me to excel and grow. My whole family (especially my dad who he worked with in the studio for many decades) considered him a member of our own, and our hearts goes out to Sherry and his is entire family. I will miss our coffee chats. But fortunately there are hours of music to remember him by and visuals of him behind his keyboards making magic. A legacy that will not soon be forgotten - Rest in peace Kenny, my friend and brother. I knew Kenny (aka Kenny carrot) back in the late seventies. He was part of a band playing in Duluth, MN. I will never forget his soulful vocals. I loved listening to him sing. When we all left Duluth, I learned that he and Sherry Carr (she was in a different band), got together and were living somewhere in the West. Jim and I tried numerous times to locate them, without success. Ricc told us of all the health problems Kenny (and Sherry) have had to deal with. We're both so sorry that he had to go thru all that, and now learning that he has passed. Way too soon. Sherry, you have our deepest sympathy. To Kenny’s family, I send my condolences along with thoughts and prayers. We were next door neighbors when Kenny was just a wee boy. I remember him peering through the fence and that sweet face of his. The Garrett family will always be remembered in this heart of mine. It was a pleasure and a treasure to have had all of them in my life. Kenny, Sherry, and I were bandmates in Minnesota in the late 70s. Living out of motels and band houses, the stage was the place we called home. Standing next to Kenny on stage, you couldn’t help but play your best. The level of his musicianship inspired everyone to be at the top of their game each night we took the stage. He was incredible on keyboards. 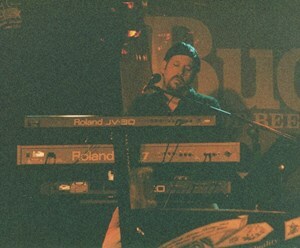 For me, he set the standard by which all other keyboardists I worked with in later years would be measured. And few would ever come close to Kenny’s virtuosity for he was simply the best. And yet there was still the off-stage version of Kenny that I was fortunate enough to know. The stories he loved to tell me about growing up in Casper. Kenny was honest and generous to a fault. Twice in my life I found myself at a major crossroad. Both times, Kenny was there to help me along. Kenny, Sherry, and I shared a special, if not spiritual musical connection. My memories of our time together are still vivid. Gosh, his sense of humor… I can still picture the way Kenny would snicker at me if I flubbed a note, and I can still hear him sneaking in a spontaneous musical malapropism ala Victor Borge during one of his piano solos. Kenny was just a joy. I’m so blessed to have walked with Kenny, if only for a few miles, down the long and winding road. He made every step worth it. I’ll miss you, my friend. I was fortunate enough to know Kenny as a friend, mentor, and musical collaborator. I got a chuckle reading another guest's comment that he could be "pretty grumpy sometimes," which is true. But he had an incredible soft spot for kids and animals--especially dogs. He played a vital role in the Casper music scene--and my own musical growth--back in the day. His store, Casper Music, was a place where musicians from all over the region could pop by and share their stories from the road, have a laugh, and get a good deal on music gear. He would often let me observe over his shoulder in the studio as he composed the most awe-inspiring music I have ever heard--all the while being not too impressed with his own sublime work! I want to express my condolences to his lovely and uber-talented wife, Sherry, with whom I also had the pleasure of working in the Kenny Garrett jazz trio. We also played together on the Casper Music-sponsored softball team...good times...great memories. Thanks for everything, Kenny. You will be missed. Dear Sherry!!! All of my family just loved Kenny. He could be kind of grumpy sometimes. My little granddaughter Rhea would see him and her face would light up and she’s say “There’s my best friend Kenny”. He would just beam. I love him and will miss him he brought my husband as well as the rest of our family great joy!!! It was an honor and a privilege to witness your genius, old friend. I met Kenny in 1973 when I joined the Casper Troopers. He was playing the living daylights out of a set of triple drums. So I naturally assumed he was a drummer; until a couple years later when I filled in for a drummer in a rock band in Casper and when I showed up, Kenny was playing piano and organ. Then I knew, even at the age of 18, why God put Kenny on planet Earth - to play the fire out of keyboards. I've been blessed and lucky in my life; been able to hang out and hear some of the finest keyboardists who ever went on a stage. Kenny is right up there with Spencer Bohren in terms of the best instrumental musicians to ever come out of the State of Wyoming. Kenny could play any style on demand, but to hear him play jazz, R&B or the blues, was truly a feast for the ears. I can't really express to you just how great of a musician he was without being tempted to drop an "F Bomb," so I'll just say that he played the piano like he was in love with it. And you know what? - That's the true beauty of seeing and hearing a person do what they have been created to do because this cat....Kenny Garrett....was in love with every note he ever played. Rest in peace my friend. Heaven's got one helluva piano player now....les bowron, Nashville TN. Kenny and I were friends for years. I was in his music store countless times and always enjoyed talking to Kenny. I still have music equipment that I purchased from him 30 years ago. Tall Paul says good bye to one of the best keyboard players in the business. I remember Kenny as a youngster going to play with Don Bean at the Colonial Lounge. What a talented guy with his music. In a blink of an eye there he was with his beautiful bride playing at a club here in Casper. He seemed even more talented and what a sound those two put out. So much fun we had with them. I remember that special little crooked smile he gave everyone. Then we both traveled a not so fun road with the kidney problems. We shared and encouraged a lot at first. Loved that sweet man. Rest In Peace and God be with you,Cheri, and all your families.